Dallas Morning News Cuts Five In Latest Round Of Layoffs. 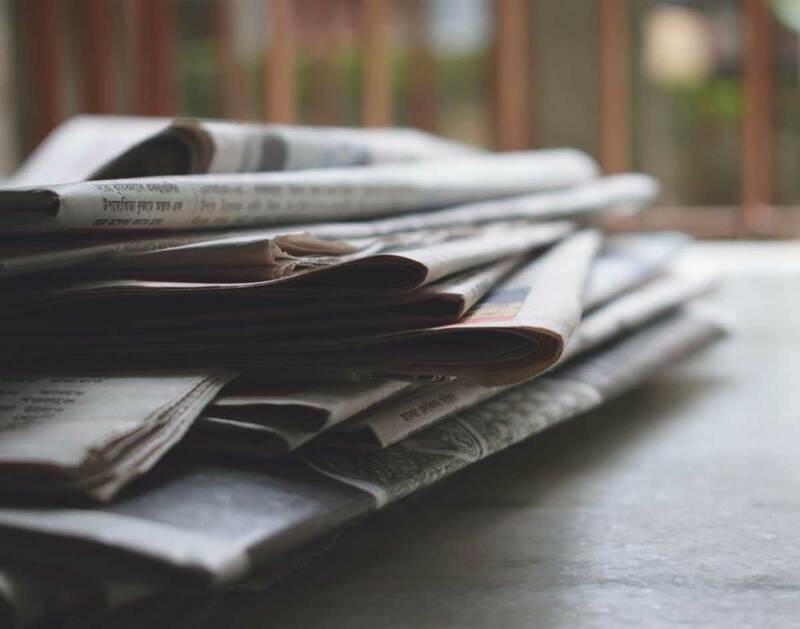 Dallas’ Only Daily Newspaper Laid Off Three Journalists And Two Members Of Its Administrative Staff Today As Part Of An Ongoing Effort To Reduce Its Editorial Budget. The Dallas Morning News laid off five of its editorial department employees today — three journalists and two members of its administrative staff. Central Track can confirm that investigative reporter T.L. Langford and sports media columnists Barry Horn were among the journalists let go. Langford’s tweets about the layoffs this afternoon appear to be where much of the day’s social media speculation about this latest round of layoffs at the DMN began. DMN editor Mike Wilson announced the news to his staff via an email, which has since been obtained by Central Track. 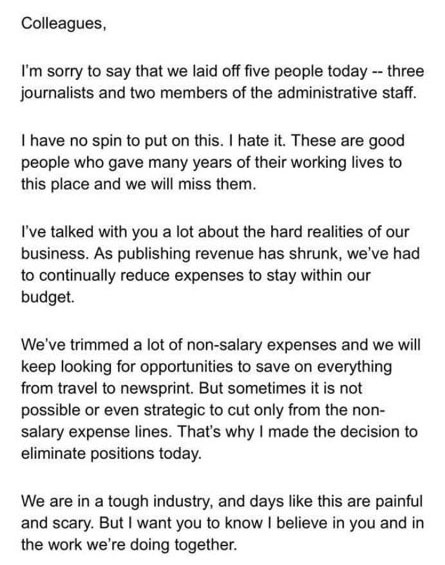 In his note, which was sent out shortly after noon today, Wilson laments the “hard realities” of the “tough” print media business, acknowledges that the paper’s “publishing revenue has shrunk” and notes that the paper’s higher-ups had “trimmed a lot of non-salary expenses” before resigning to lay off five members of its staff. We don’t envy Wilson for having to pen that email or for having been put in his position. While there’s of course no upside to news like this, we’re guessing the majority of the DMN‘s staff is breathing a sigh of relief this evening. In a world where media layoffs come fast and furious, a five-person round feels like little more than a minor drop in an unfortunately massive bucket. But it reads a but like a sticking one’s finger in a dyke. Perhaps that’s why, even before specifics about the layoffs could be gathered, journalists across the country began expressing their displeasure at the mere speculation that some cuts had gone. In a tweet that has since gone fairly viral, Los Angeles Times correspondent Matt Pearce shared today the publicly available SEC filing data of the Dallas Morning News‘ parent company, the A.H. Belo Corporation, and noted that its top brass continues to earn annual raises as its paper’s editorial department is forced to undergo another round of layoffs. According to those numbers, four of the top five earning Belo executives of saw their combined salaries increase by $360,880 between 2016 and 2017. Assuming the average journalist makes $37,820 per year, that total is enough to keep more than nine journalists employed full time for a year. In case you were wondering, real estate experts say an annual salary of $61,039.97 is currently required to cover the principal, interest, tax and insurance costs of a median-priced home in Dallas. Obed Manuel contributed to this report. Previous ArticleThe Central Track Baller Pack: Fortress Fest ’18 Edition. Next ArticleThings To Do In Dallas On Thursday, March 29.